I am not sufficiently familiar with the war in Indochina or the history of the French occupation although my great grand-father was posted there as a prison guard but I’m interested in the topic. I think studying it would help us understand the war in Vietnam much better. Pierre Schoendoerffer is the go to director for those interested in the war in Indochina from a French perspective. I’ve seen his Dîen Bîen Phû (1992) a long time ago, pre-blogging, and remember having been impressed. Usually it is considered to be one of the top war movies. However, critics seem to agree, as great as Dîen Bîen Phû is, it’s nowhere near as outstanding as one of Schoendoerffer’s other movies, namely 317th Platoon – La 317ème section . It’s one of a very few 5/5* movies in Gary Freitas’ excellent book War Movies. Schoendoerffer is a veteran of the Indochina war. He was an Army cinematographer and became a POW during the battle of Dîen Bîen Phû. After his liberation in 1954, he wrote books and directed movies. One of those novels was the 317th Platoon (French only) which he made into a movie later. 317th Platoon tells the story of a platoon which was trapped behind enemy lines. In 1954, the war in Indochina is about to end. France was defeated by the Viet Minh and had just lost the bloody battle of Dîen Bîen Phû. The French forces are in full retreat. The risk to be overrun is constant. The 317th Platoon, a unit of French soldiers and Laotian allies, is one of them. The platoon is led by a very young and idealistic and inexperienced sous-lieutenant Torrens (Jacques Perrin) and his adjutant Willsdorf (Bruno Cremer), a former soldier in the German Wehrmacht during WWII. Torrens has just arrived in Indochina, barely two weeks ago, while Willsdorf has been there several years. The survival of the platoon depends on completing a trek through enemy territory, right through the dense jungle that lies between them and the next French outpost. The movie has an immediacy you do not see often. The spectator is very close to the people in the movie, feels like being part of it. The grainy black and white pictures are like documentary shots and the sound is amazing. We hear all the animals in the jungle screaming and screeching. The jungle is a loud place to be, especially at night. For the soldiers this is an additional difficulty. The Viet Minh swarm the forest, the noise is deafening, the monsoon rain is constant, it’s hot and humid, they suffer from stomach cramps and diarrhea, dysentery. In the first few minutes, some are wounded horribly and to watch them suffer and die is agony. The death scenes are uncomfortably realistic. The movie offers excellent character studies. The men portrayed, especially Torrens and Willsdorf are complex and arresting. While Torrens makes bad choices because he is kind and caring, Willsdorf has become a cynic but he is always right about his assumptions and predictions. The unlikely men come to appreciate each other in the end. I liked that we get a feeling for the country and the terrain. We see this when they stop at a village to rest and treat the wounded. The wounded are given opium in the villages, Willsdorf tells Torrens how much he loves the country and that he cannot wait until he can leave the army and settle somewhere with a nice woman. There are many quiet scenes in the movie but it’s never boring. The actors are excellent. In some of the shots their faces express more than others with words. We see that they feel lonely, how much they despair, the fear, pain and agony. It’s all there and palpable. The way the wounded are treated is another excellent example of the movies realism. There is not shooting morphine without assessing the condition of the wounded first. The way they treat them is with a lot of understanding and empathy. The only other movie I have seen so far which offers such a compelling mix of character studies and combat scenes is When Trumpets Fade, one of my Top 10 favourite war movies. 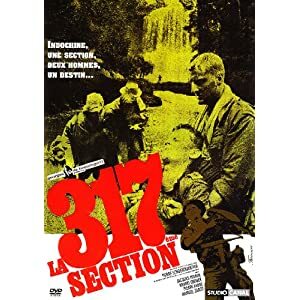 I’m certain of one thing after having watched 317th Platoon, there is no way around Pierre Schoendoerffer’s movies for those truly interested in war movies. 317th Platoon – La 317ème section deserves to be on a Top 50 list, at least. I found two things on YouTube. The French trailer and a dubbed version, Spanish with English subtitles, of the entire movie. It’s a bit weird for me, from a French perspective to hear it spoken in Spanish but if you are not a native French speaker you might not mind. At least you get a chance to watch, right? This entry was posted in France, History, Infantry Combat, Movie, Reviews, War Movie and tagged 317th Platoon, Bruno Cremer, Dien Bien Phu, French movie, History, Indochina war, Infantry Combat, Jacques Perrin, La 317ème section, Movies, Pierre Schoendoerffer, Reviews, War in Indochina, War Movie. Thanks Caroline: I’ll have to see if I can find a copy. I hope you can find it, it’s a great movie. If you haven’t seen Dîen Bîen Phû yet, it’s very good too, less character driven but good. Thanks for the review mainly because I was aware of the movie and really wanted to see it, but no Netflix. I had no idea it was on You Tube! For me perosnally it’s a bit horrible to hear it dubbed in Spanish but it is way better than not being able to watch it at all. This is one of only two movies that got rave reviews in my three main sources – Brasseys, Videohound, and Freitas. The only other one is “A Midnight Clear”. I’m not surprised at all but surprsied about A Midnight Clear. It’s not even mentioned in Freitas, don’t you think it was When Trumpets Fade which I mention as well. It’s in my Freitas as a 4.5. Perhaps I have a later edition. When Trumpets Fade has a 5.0. When Trumpets does not appear in Brassey’s which is odd. Maybe its because it was made for TV. Yes, 4.5, this one has a 5. there is a huge difference, for me at least. This is an excellent movie with a remarkable point of view, that of an actual war filmmaker (Schoendoerffer’s Vietnam documentary The Anderson Platoon won the Academy Award in 1967). The viewer is part of the platoon, which the camera never ever leaves for narrative shots that would try to explain what happens to the guys who just left, or what the enemy is doing, or what the big picture of the conflict may be. It doesn’t try to impress you with special visual or sound effects, blood spatter, biographical melodrama. Yet the constant fear, the long waits and walks followed by very brief skirmishes, the continual presence of death make it quite immersive, and probably very true. Not realistic, true. The adjudant is an Alsatian forcibly drafted into the Wehrmacht during WWII, who fought on the Eastern front against Russia until the end in Berlin… and doesn’t complain a bit about it. At first, this should make him quite unsympathetic to many audiences (including of course French audiences), yet the film manages to put us in a non-judgemental position, making us understand that this man has at some point chosen a certain life, and lives true to his choice. And so did the young lieutenant, almost his opposite at first sight with all his idealism and inexperience… yet who gains the former’s respect and our understanding when he launches a last attack, a ‘charge of the Light Brigade’, though he knows the French Army has lost the Indochina war. 317th Platoon has a clear angle: it is about soldiery itself, and what it means to be a soldier even in defeat. Whatever the odds, the fate, or even the army you’re in. Well said, I really agree. It’s the immediacy that makes it so compelling, no unnecessary adornment or silly side stories. I thought Willsdorf’s story was quite interesting. I’ve never thought of it. But it’s another explanation why Alsatians are never really seen as proper French by many. And some would have preferred to stay German. I’m planning on watching The Anderson Platoon as well. What I like is that the director doesn’t resort to cheap political tricks. It would be so easy to ‘spin’ the information that Willsdorf fought in the Wehrmacht either to make him a ‘bad person’ (booh the Germans) or even a ‘good’ one (booh communism), yet it is not done at all. What we are left with is that the man has been a soldier for ten years, and he remains a pretty good one through defeat. And of course, the ‘colonial’ views of the French (when it comes to vietnamese women, or their managing the asian soldiers as mere children) are clearly politically incorrect – even for the time of the film’s release. Yet, it sounds and looks so true ! No complacency here either, the fact that we might approve of them or not is not the question : they are what they are, and tragedy is not a matter of opinion. I thought it was pretty unemotional and, as you say, things were shown just the way they were. I liked how the two men were shown as opposites at first but in the end they were quite similar. The end part was quite chilling, when we hear Willsdorf was then sent to Algeria. He was probabaly one of those men my father used to talk about, fresh from Indochina and somehow still believing to be there and calling the Algerians the Viets. History gets even more complicated as a number of Algerians who had joined the Free French Army during WWII also fought in Indochina against the Viet-Minh… and then split, some fighting on the French side during the Algerian war while others were fighting for independence within the ALN/FLN. There’s a reminder of this in A Captain’s Honor: the French Captain started fighting in the Resistance as a teenager, then Indochina, then Algeria. His (invisible) Algerian enemy has an impressive war record from Cassino to Diên Biên Phu. It’s hard to imagine, being at war for 20 years. I don’t remember this from Cpt Conan so well. Here what P Schoendeorffer said by the way its film. Schoendoerffer turned in the order of the scenario, partly with real balls for lack of sufficient budget to acquire ammunition with white. And it was quite content to have with him former comrades of combat who could make use of the rmes under about secure conditions. Thanks you so much for sharing this, Dominique. So interesting. I get why he would want his actors to experience what it was like. You can feel when watching his movies that he was there. The movie clearly influenced Eric Zonca’s Soldat Blanc (‘White Soldier’, 2014), a rather ambitious French TV movie about the early years of the Indochina War (1946-1950). It’s a mixed bag, with some great scenes and… many flaws as well. A commendable work though, be it only because French war movies actually focusing on soldiers are few, and movies about this conflict even fewer. Now that’s something I’d love to watch. I doubt it I’ll find it though. I’ll have look. Thanks for mentioning. The DVD is out, without subs alas for non-French speakers. Plus a little birdie told me it’s on YT at the moment. Thanks, I saw the DVD. I rarely watch on YT. But thanks. Well, there are some gems on YT, such as the recently restored director’s cut of Claude Bernard-Aubert Patrouille de choc (aka Patrouille sans espoir, ‘Hopeless Patrol’, 1957). It’s a pretty good movie chronicling the progress and demise of a small French outpost in 1951. The young Bernard-Aubert was a war cinematographer in Indochina, and the work – shot in ’56 in South Vietnam with the support of the French Army – has a distinct documentary feel (along with some neat ‘classic’ war cinema moments, à la Samuel Fuller). There are no stars, the tone is dry, pretty much low key, and the ‘message’ is rather straightforward: this is a useless war made by ‘children’ in an alien and remote place. Thanks you for pointing this out. I’ll have to have a look. Samuel Fuller moments will always pique my curiosity. Plus the fatct that he was a war cinematographer – that should help finding meanigful ways to depict a conflict. I’d be interested in Charlie Bravo too.